Although it has taken me a while to consider a personal blog, enough of my friends and family have suggested this format. It has been over a year now that I have lived full time in Nicaragua. Some of you think I am the craziest woman in the world and to those I am. I love it here though. Life is very different from the US in so many ways. People who live with dirt floors are not homeless and they are happy. There is always rice and beans–galla pinto–to eat for everyone, including me sometimes because I like it. I am no longer actively working at the Roberto Clemente Clinic, however, I have been consulting for two rural village clinics–one outside of San Juan del Sur, the other in Gigante. It seems odd to me that I am considered an expert for clinic development and after watching and nudging a clinic project to progress for eight years, I guess I qualify as expert. My beautiful condo in Rancho Santana is rented again by the same family for another whole year. So I live in a compound in the village of Limón #2 where the 35 people of the Guzmán family look after me and I am very safe. I have the Guzmán pulpería next to my house, and the latest building/enclosed hut within the compound is a little restaurant that makes typical Nicaraguan food and sells the freshly baked bread that is made here in the compound by family members. I am the elder here and give counsel in food preparation, organic gardening, nursing, transport to the Clinic or Rivas or Managua on occasion. In return, I am allowed to remain in my house all day without disruption if I so choose, or sit out in front of the Pulpería and visit with whomever else is enjoying the wonderful outdoors or visit my many friends at Rancho Santana. Hopefully I will be able to enjoy a full time ocean view again within the next two years. In the meantime, I learn more Spanish everyday because I have to as my family here speaks little or no English, and I enjoy being alive in my Paradise. 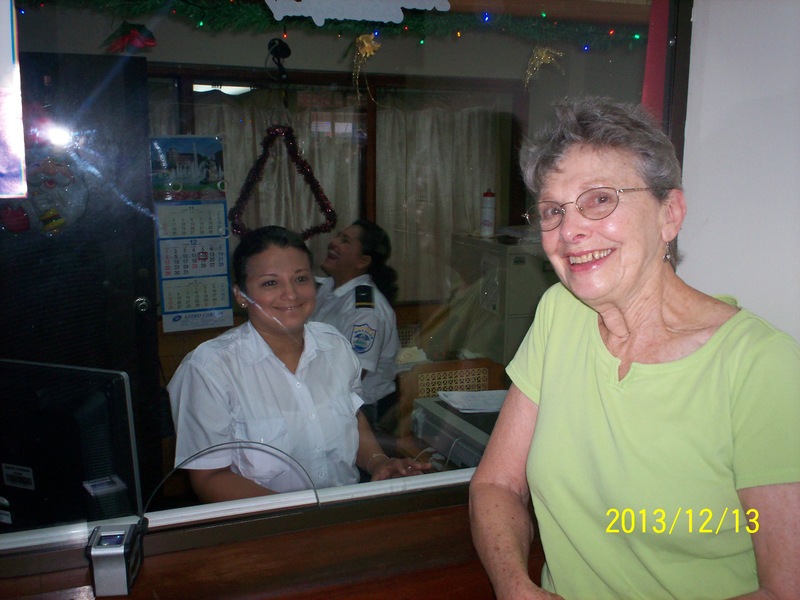 Margie at Nicaragua Immigration, residency accomplished. Remember: Solo el amor prevalece. Only love prevails. Your blog has certainly presented a brief but more realistic appraisal of the community surrounding Rancho Santana (RS) than many others; some of it has been direct and some indirect information. I have the impression that you actually are a resident of RS but were building a home in the local community. Hopefully you do not mind if I ask a few questions about RS as I am interested in the possibility of living there. Or, as you in the local community. Before I continue too much more perhaps it would be best if I introduce myself. I am an engineer that has been working in the oil and gas industry for a few decades. Most of this has been in the offshore oil & gas arena with work in most of the shipyards throughout Asia. Toss in a few stints in South America and one might say that I have a little international exposure. You commentary about assisting in the local community has caught my attention. After many years of living and working with the local populations, I am not sure if living in a “gated” community fits my lifestyle. I have found that I enjoy my time more with the locals than my expat peers. I am looking for a permanent place to live and Nicaragua certainly has a fair amount of appeal. Other places on my list are Eastern Malaysia (Borneo), Central Viet Nam and the Philippines. Yes, each has their good points and bad points. I am curious about your local house building from a number of perspectives. Are you moving from RS to live closer to where you actually spend most of your time? Is RS too remote? Is getting a house built a difficult task – local vs RS (they certainly seem to have a premium building cost). I have just finished taking note of your 28 October epistle. I certainly liked – “I am currently a person for Business Plans, Land Sales, Wound Care, Health Triage, Area Guide, and Business Referral.” Perhaps when you have a moment or two you can assist with a couple of your specialties.